The heaviest fabric door in the ADV-X series, Model 884 ADV-X is designed for exterior applications where weather elements may be extreme. The patent-pending articulating roller wind strut reduces noise and allows the door to operate under wind load. 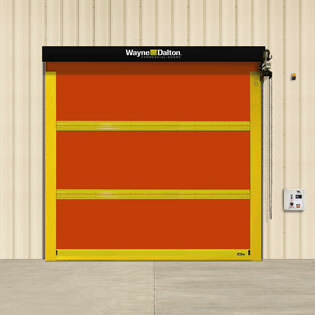 This door is capable of withstanding pressure of up to ±22 psf or 158 mph and can operate under pressures up to ±5 psf or 75 mph.